Other than drums, this is a one man show. 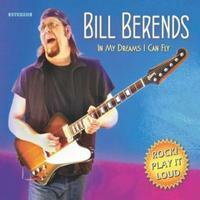 Bill Berends lays down a fairly wide range of rocking sounds in the course of this instrumental album. The man can really play. This does a great job of avoiding sounding redundant or trite. With an instrumental disc like this, that says a lot. The only real issue is the production and it’s not really all that bad. It just doesn’t sound top notch, feeling a little flat perhaps. All in all, this is great stuff, really. There is a killer rock and roll groove to the opening title cut. It features some great melodic guitar soloing and is a cool instrumental that has a lot of energy. There is definitely a bit of a psychedelic rock element to this thing. Wow! This is an awesome groove. It’s got a real Joe Satriani, Steve Vai kind of element to it. It rocks like crazy. Even though the opener was great, this is even better. This cut starts off mellower and keeps coming back to that more laid back approach as it continues. There are more powered up sections, but this remains less rocking than the two openers. It’s still got plenty of great instrumental work and nice musical elements. More of a hard rocking jam is heard here. This one borders on early heavy metal. The opening riff on this makes me think of Judas Priest’s “Living After Midnight” just a bit. The cut is set more in a melodic rock and roll sound overall, though. I’d have to say to me this feels like combining a bit of a Southern rock vibe with Eric Clapton circa Derek and the Dominoes. It’s another solid jam. To my ears this one lands in the jam band territory, but there is a bit of fusion in it, too. It’s a mid-tempo rocker that’s fun. There is a bit of a bluesy edge to this at times. Overall, though, I’d consider it to be more or less a fusion tune. It’s one of the better pieces here, too. It’s got multiple layers of guitar soloing off each other in fine fashion and it has some nice shifts and turns. This might well have some of the best guitar soloing of the whole album. It’s definitely one of the highlights of the set. Another standout cut, this one definitely could fit under a progressive rock heading. It starts fairly mellow and eventually works out into a harder rocking, but still quite melodic, movement. As the piece continues it returns to the more sedate territory later. After building out again to some seriously soaring music, it drops back down once more. Then it gradually fades out as that mellower movement continues. Opening in a very psychedelic rock based sound, this thing works out from there into some great classic rock leaning music. There is almost a bit of a Beatles vibe here at times. Although classic rock is the main order of business on this one, it’s hard to deny fusion, blues and even some country in the mix. It’s another smoking hot instrumental. I can definitely hear some 1970s southern rock, the mellow melodic variety here. This is the only song that really stays fairly sedate throughout. It’s got some fusion in the mix. Normally, I’d think dropping down like this to end was a mistake. Somehow, on this set it seems to work really well.